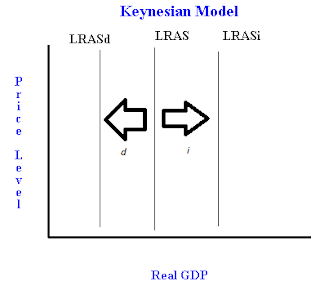 What causes the Aggregate Supply curve to shift? What are the determinants of Aggregate Supply, a look at both LRAS and SRAS. - FreeEconHelp.com, Learning Economics... Solved! Home aggregate supply and demand macroeconomics What causes the Aggregate Supply curve to shift? What are the determinants of Aggregate Supply, a look at both LRAS and SRAS. What causes the Aggregate Supply curve to shift? What are the determinants of Aggregate Supply, a look at both LRAS and SRAS. Less labor, capital, or a decrease in tech. Note that the only to shift the SRAS curve without also shifting the LRAS curve is through a temporary change in input prices, or through changes in price expectations. 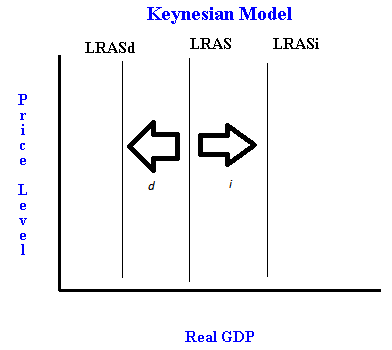 The following graph shows both an increase in the LRAS curve (the rightward shift represented by the i), and a decrease in the LRAS curve (the leftward shift represented by the d). 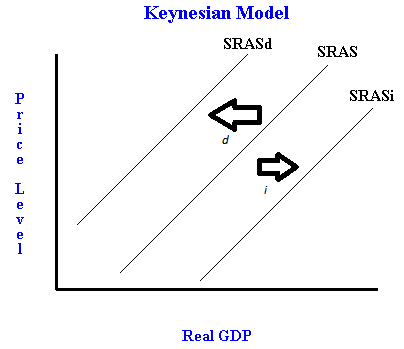 The next graph shows both an increase in the SRAS curve (the rightward shift represented by the i), and a decrease in the SRAS curve (the leftward shift represented by the d). New raw materials mean that new sources of reserves for primary commodities such as oil and gold are found. An increase in these reserves shifts the AS curves right. However, each year the curves will shift left as some of the reserves are used up for production. Input prices are the dollar cost of rents and wages paid to capital and labor. If these costs go up relative to the price of output, then production will decrease and we will see a decrease in AS. Trade barriers are quotas and tariffs enforced by an economy. With less trade barriers in place, countries are free to focus on production of the good or service they have a comparative advantage in. With high trade barriers, they must produce everything themselves, including goods that they do not have a comparative advantage in. Competition has to do with the number of firms and businesses within the economy. With more competition, more firms and businesses are producing goods which can lead to higher levels of GDP. Also, increased competition forces companies to be more efficient, and use resources more efficiently. This will also cause an increase in aggregate supply. Regulations have a direct impact on productivity, and more regulations hurt the productivity of firms. For this reason more regulation results in a decrease for aggregate supply. Increases in labor, capital, or technology increase the amount of stuff that can be produced so aggregate supply will increase. Finally, education plays an important role in the productivity of labor. With smarter people, more can be produced so the aggregate supply curves will shift left. Temporary price shocks or changes in price expectations affect only the short run aggregate supply curve. For example, after a natural disaster in a region that produces oil, the price of oil may go up. Because this shock is temporary (the region will rebuild and produce oil again) and is a permanent change in the economy, then only the SRAS curve will move. Another example is an increase in expected future prices. If firms believe that prices will rise, then they will shift their production to accommodate this higher price. In essence, the SRAS curve is adjusting to higher prices (resulting in a higher price level) before the change actually happens.